What’s the first thing that happens soon after you find out you’re pregnant? You begin browsing baby websites and picking up baby magazines at the local grocery store. 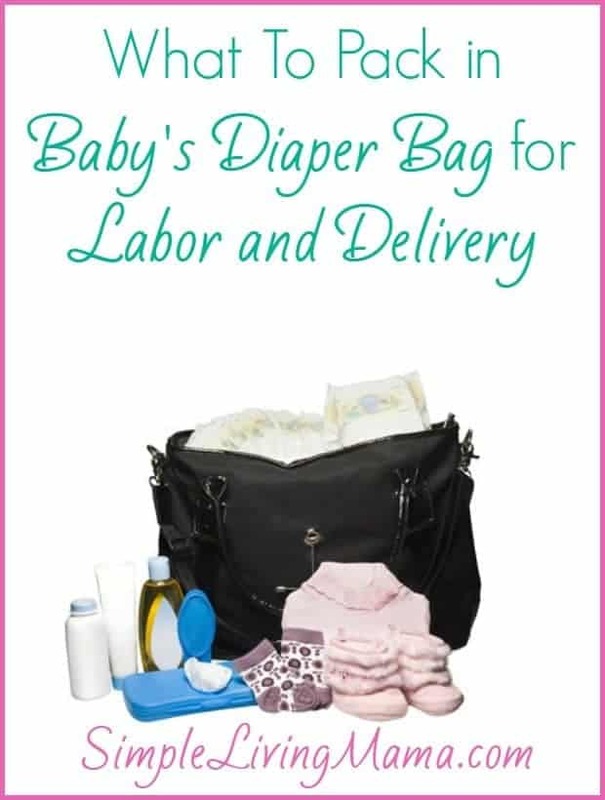 Before long, you find yourself completely bombarded with all the baby products you just HAVE to have and all the pregnancy tips you can manage. Don’t get me wrong. There’s a lot of cool stuff out there, but if you’re trying to have a baby on budget, you can get away with way less stuff than that baby magazine would have you believe. How do I know? Well, I’m expecting my fifth baby in just a few weeks. This is my fifth baby in seven years. I’ve learned a lot about babies, parenting, and pregnancy in that time. I also know that a lot of stuff is a waste of money! So, what do you actually need? Let me tell ya! Something to feed your baby and a way to feed them. Okay, this one depends a lot on whether you are breastfeeding or formula feeding, or maybe both. Please do not go out and buy a bunch of bottles before your baby is born. If you are a stay at home mom and you start off breastfeeding, you may not use bottles at all. If you are breastfeeding and use bottles, it may take some trial and error to find the right ones. If you are formula feeding, well, you still might need to try a few bottles before you find the right ones. Buy a couple of different bottles and test them out. Playtex VentAire are my favorite. I don’t personally use a breast pump much, but that may be something you need to have, especially if you will need to leave your baby for any length of time. I bought the Medela Swing and have been happy with it. Breastfeeding mamas, stock up on nursing pads, soothies, and lanolin. I also really love nursing tanks. Yes, you will need clothes. I start out with at least six baby gowns, several onesies, and several cute outfits. I also make sure to have at least three little hats, six pairs of socks, and three pairs of mittens. Newborns scratch themselves, and it’s hard to file or trim their little nails, so the mittens help save their faces. I love to stock up on kids’ clothes at consignment sales, but I’m also a huge fan of Kohl’s. If you hit the sales or clearance racks, or check for those items online, you can get new clothes for the same price as the consignment prices. I have gotten several pieces in this gorgeous pattern for my new little girl. I LOVE it! Don’t forget to have several blankets and burp cloths on hand, as well. Somewhere for them to sleep. We usually co-sleep, but I do love the Rock-n-Play sleeper for my newborns. Plus, it’s relatively inexpensive. A crib is nice to have. You can get by with a mattress and sheets. You don’t have to buy fancy bedding unless you just want to. I really love my Moby carrier. Babywearing is awesome, and I highly recommend a baby carrier of some kind. A swing can be a lifesaver. While they do take up quite a lot of space, I wouldn’t go without one. I scored mine at a comsignment sale for less than half price! Baby wash/lotion – My fave is Aveeno. There are still a lot of items that are nice to buy and have, but they aren’t necessary. Babies just want to be warm, fed, and loved! So, next time you’re browsing that baby magazine, don’t get overwhelmed by all the cool gadgets out there. Is there anything else you would add to this list? 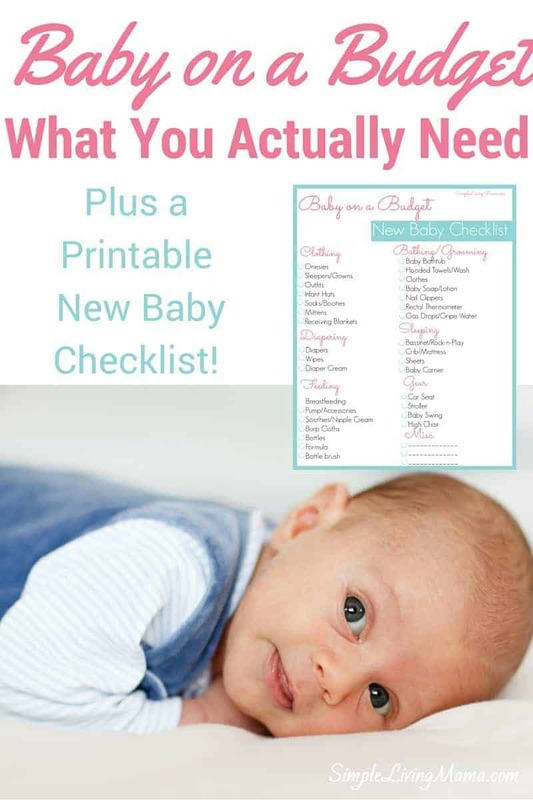 Want my FREE Printable new baby checklist? Sign up below! 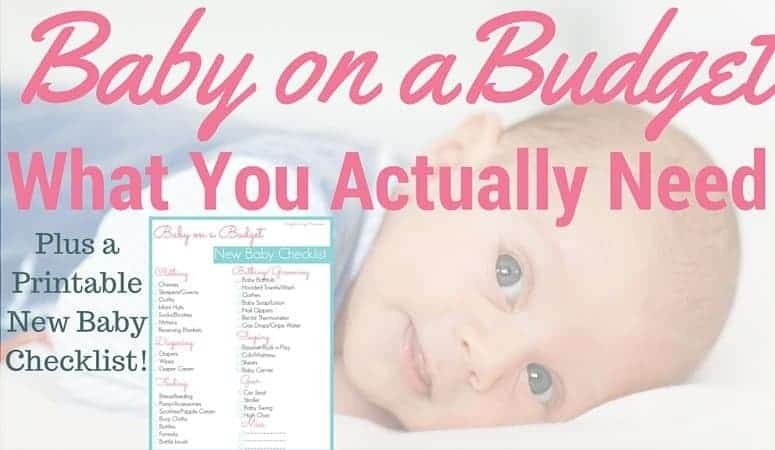 Great list of product for babies and cut the budget as well . Love your post.